My son Matthew and I visited Clonmacnoise this week. It is the site of a monastery that was founded, only a century after Ireland became Christian, in 548 AD. It has the finest collection of ancient Irish High Crosses anywhere in the world. These crosses have illustrations of scenes from the bible and were used to teach the Christian faith to people who could not read. It is located on the banks of the River Shannon, just beside the ancient road that ran from east to west across Ireland , along the line of the eskers or gravelly mounds left behind when the ice melted at the end of the ice age. As the Shannon was navigable, and Clonmacnoise was on the east/west road, it was in a sense the cross roads of ancient Ireland. Clonard , another ancient monastic site which we visited, is also located close to the line of the eskers and on the ancient east/west road too. 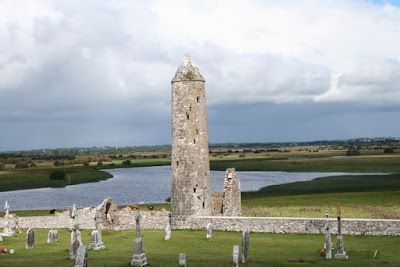 Clonmacnoise was a very important European monastic site, and site of learning, from the 6th to the 12th centuries AD. 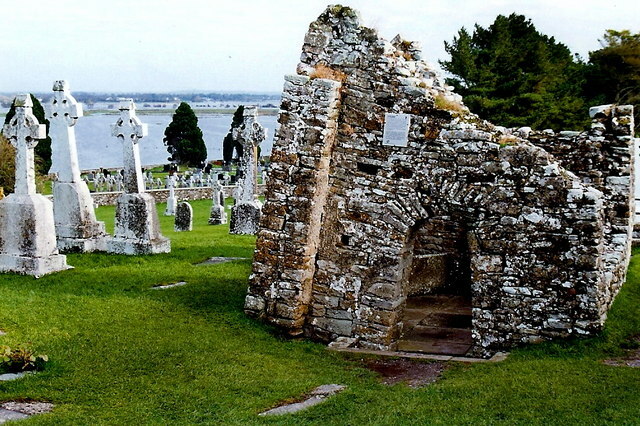 The first Christian High King of Ireland was crowned by the founder of Clonmacnoise, St Ciaran. The last High King of Ireland, Rory O Conor, is reputedly buried in Clonmacnoise, although I could see no mark for his grave. St Alcuin, the English monk and bishop, who was an advisor at the court of Charlemagne, reputedly received some of his education at Clonmacnoise. As if to underline the European significance of the site, the other visitors we met there were a large group of tourists from Narbonne in France. Pope John Paul the second visited Clonmacnoise in 1979. There is a good interpretative centre at the site which introduces visitors to the lives of the monks and the beautiful works to be seen there.